The program runs for a period of 15 days on full time basis (6-7 hours a day) outside school premises during summer or winter breaks. It caters to children with age between 12-15. The purpose is to enable children to make independent choices in life to realize their dreams in long run. 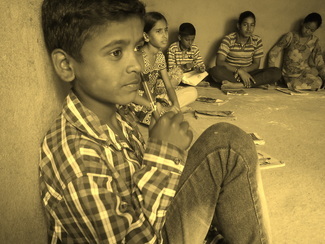 We use various techniques such as meditation, reflection, dialogues, short movies, songs, indoor activities, painting, outdoor activities etc to achieve the purpose of Holistic development of the children. Here is what we did in SwaNirmaan 2017 and in SwaNirmaan 2015. The program runs for a period of 8 to 10 days, 1-2 hours daily during school time while being in collaboration with local schools based on their willingness. It focuses on Project Based Learning approach wherein students (age group varies between 12-15) are required to identify their own team projects in the village and learn while executing the same. The program aims to give its participants’ a glimpse of how it is like to live in the real world outside school boundaries. It focuses on skills like communication skills, planning skills, team work and presentation skills through building an understanding of the functioning of an institution while conducting real time projects in the community. The main features of the program are to sharpen the skill of asking questions and putting the same into structures, to understand the value of team work and to utilize time in proper manner while meeting project deadlines. The projects have a wide range from understanding a Panchayat's functioning to learning how a hotel runs. The students are free to opt what they wish to learn. We run an alternative learning Center in our community wherein kids (Age 10-14) come after school hours to learn from various available resources. Our effort is to build a space in which kids are free to spend their time the way they wish to. They may choose to read books, or play chess, or write stories of their own, or sing songs, or draw pictures, or learn Maths, or simply sit with their own selves in silence. Till December 2015, we had a total of 33 kids registered for the learning center, out of which around 22-25 chose to visit us on daily basis. And we kept the space running five days a week, 2 hours a day. We also choose to float group projects so as to motivate kids understand their community better and learn from the experience of their elders. At present, our kids are busy surveying community members with an aim to understand their mindset on various issues ranging from lifestyle to money. ‘Sharing’ is a value that requires a special mention when it comes to our learning center. The space that we all have created stands on the spirit of sharing whatever little we all have. We share our footballs, and we share our walnuts. We have created a culture where kids are not the receivers and we are not the givers. Instead, we all are contributors and we all are beneficiaries. The overall idea is to facilitate kids think independently and realize how important it is to be happy and to make choices in life that comes from the Heart. 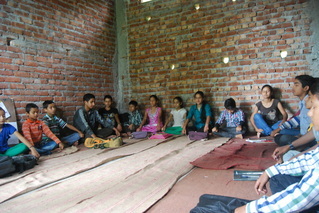 In our attempt to change the way kids learn in schools, we conducted two innovative courses in a low end private school in Baijnath. 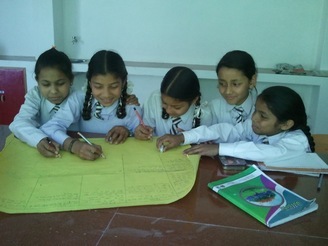 Project Based Learning was based upon the idea of learning academics through daily life themes such as water, forest etc that we usually come across. The idea was to connect different subjects with one theme and teach them all holistically to the kids in one go. This approach is becoming famous day by day and very recently Finland Government has decided to pursue the same in its entire education domain. Nurturing Enquiry, on the other hand, was a course that aimed to question and re-think the assumptions our society has made or tends to make, thereby providing a space to kids for developing their own thinking process. The course envisions to see kids as 'Thinkers' rather than mere 'Believers'. More details on the course can be found on the link here.